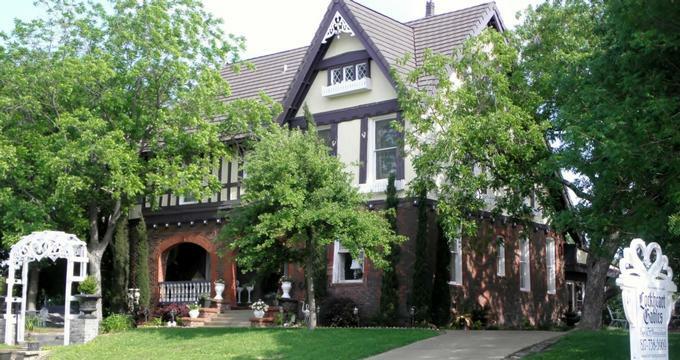 Lockheart Gables Romantic Bed and Breakfast is traditional, adults-only bed and breakfast in Fort Worth that offers romantic accommodations for couples wanting an unforgettable getaway. Set in a beautifully maintained Tudor-style mansion, the charming inn features with four-poster beds in luxury linens, heart-shaped whirlpool tubs and two-person rain showers, cozy fireplaces, and private outdoor areas. The hotel is surrounded by tree-shaded landscaped gardens and guests are treated to a gourmet breakfast every morning in the comfort of their suites, along with complimentary drinks and snacks throughout the day. In-room massage treatments can be arranged for an additional fee, and the Inn is within a few miles from several attractions such as Fort Worth Stockyards National Historic District and the Kimbell Art Museum. Lockheart Gables Romantic Bed and Breakfast feature three beautifully appointed king suites and two private cottages, which offer extra levels of privacy and seclusion. All accommodations feature comfortable king-size pillow-top beds in luxury linens and hypoallergenic pillows, and en-suite bathrooms with large walk-in showers, heart-shaped jetted tub, thick towels and fluffy bathrobes and slippers, and deluxe bath products. Each king suite is equipped romantic amenities such as aromatherapy oils, facial washcloths, makeup remover towelettes, and hair dryers, along with coffee makers, televisions with cable channels, DVD players, and complimentary wireless Internet. Exclusive extras include fresh flowers, candles, and romantic appointments, along with complimentary snacks and beverages and a library of DVDs. The Beloved and Sweetheart Cottages offers extra privacy and seclusion and feature king-size pillow-top beds in luxury linens and hypoallergenic pillows, and en-suite bathrooms with large walk-in showers, heart-shaped jetted tub, thick towels and fluffy bathrobes and slippers, and deluxe bath products. Spacious sitting areas have gas fireplaces, comfortable armchairs, and sofas and open onto private porches with swings. A complimentary gourmet breakfast is served in the mansion’s downstairs parlor every morning and includes freshly brewed coffee, tea and other hot beverages, fruit juices, fresh fruit platters, yogurt, cereals, hot entrées and signature dishes, eggs, and freshly baked bread, muffins, scones and more. Deluxe amenities at the Lockheart Gables Romantic Bed and Breakfast include complimentary gourmet breakfast delivered to the suites every morning, and free drinks and snacks throughout the day, beautiful, tree-shaded landscaped gardens in which to relax and several stunning venues for weddings and other special celebrations. The town of Fort Worth offers a wealth of attractions and activities to enjoy. Spanning 35 blocks in Downtown Fort Worth, Sundance Square is one of the finest entertainment and shopping districts in the Southwest. Made up of over 40 buildings, both modern and historical, which house an array of entertainment, retail and dining venues, the Square offers myriad things to see and do, from casual coffee in a sunny courtyard to fine dining in an elegant restaurant. Another attraction to explore is the Fort Worth Stockyards, which is listed on the National Register of Historic Places and stands testament to the livestock industry in Texas. Museums, galleries and other sites worth visiting include the Kimbell Art Museum, the Amon Carter Museum of American Art, the Fort Worth Botanic Garden, the Modern Art Museum of Fort Worth, the Nancy Lee and Perry R. Bass Performance Hall, and the Fort Worth Zoo. Lockheart Gables Romantic Bed and Breakfast offers an intimate location for weddings and other special celebrations. The Inn’s beautifully manicured gardens can accommodate up to 150 guests with two elegant venues to choose from, namely the charming gazebo and the four-level rock water feature. The retreat also offers a variety of packages to suit every budget, which includes venue and overnight accommodations for the bridal couple, ceremony/facility coordinators, non-denominational ministers, reception tables and linen, chairs, and state-of-the-art audiovisual systems.